The University of Edinburgh has been home to a rich collection of "natural history" specimens and objects for over 300 years. These collections were built up by researchers and educators as a scientific record, as a teaching resource, as a historical record of how zoology and related disciplines have flourished in the University, and as a public museum. Today, the collections are located in the Ashworth Laboratories of King's Buildings Campus, and are open to the public by appointment. The early history of The Natural History Collections was often turbulent and dominated by colourful and controversial individuals. Early instances of the collections have been dispersed as the museum has moved, and much of the original collections now reside in the National Museums of Scotland. The present collection was assembled over the last hundred years and displays specimens from all the different major groups of animals, including both non-vertebrates and vertebrates. Although its assembly was a less eventful process than the acquisition of the first collections, the story is just as fascinating and involves equally intriguing personalities. 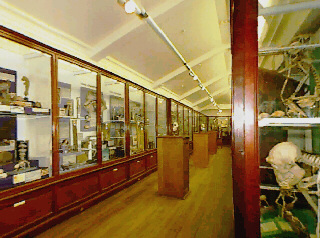 The Natural History Collections are one of the University Collections registered with the Museums and Galleries Commission. The NHC is curated by Prof Mark Blaxter and Prof Graham Stone - please email us if you have questions, would like to visit the NHC, or have comments on this web site. 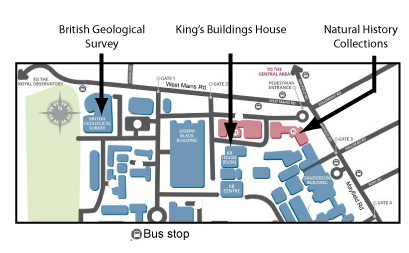 A campus map showing where we are, and also the location of other landmarks on the King's Buildings Campus is available here. Parking on-campus is restricted (except on Open Days), but there is extensive parking in the streets around the Campus. The Campus is served by buses 41, 42 and 24 from the city centre and Waverley Station (and many additional services pass close by, at Cameron Toll shopping centre). See http://lothianbuses.com/ and select the Route Map, or type our postcode (EH9 3JT) into the Live Bus Stop box. We do not have standard opening hours, as the NHC is located within a busy teaching complex. We are open by arrangement - please email the curators (Prof Mark Blaxter and/or Prof Graham Stone) well in advance so we can plan a visit for you. We are happy to show school groups round the NHC and offer themed workshops, but only in times when the University students are not accessing the Collections - again please contact the curators Prof Mark Blaxter and Prof Graham Stone to discuss a visit. The NHC is usually open to the public on University Open Days and the annual Doors Open Day organised by the Cockburn Association (a Saturday in mid- to late September) each year. The Ashworth Laboratories are accessed by the front entrance, which has 12 steps, or through a ramped and wheel-chair lift accessible rear door. The main portion of the collections is on the ground floor. The Manning Gallery with the vertebrate collection is accessed by a 25-step staircase. At present there is no wheelchair access to the Manning Gallery. Toilet facilities are available. The invertebrate and vertebrate specimens are displayed within a taxonomic framework to illustrate the diversity of the Animal Kingdom. 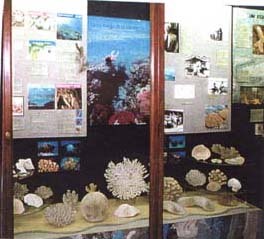 The exhibits are located in the Museum Suite in the Ashworth Laboratories, at King's Buildings. Please browse what we have on display by following the "COLLECTIONS" link below. This web site was created to enable people, who cannot visit the Natural History Collections in person, to enjoy our specimens as they are currently displayed in their original home in the Ashworth Laboratories. The pages are not intended to be a comprehensive survey of the whole Animal Kingdom, as many such web sites exist. The most important sources used to gather information on the biological significance of our specimens are listed in the bibliography. As part of an educational institution, we are delighted if viewers down load photographs of specimens for private study but would point out that copyright for all material, unless designated otherwise, is held by the University of Edinburgh. We would be pleased therefore if anyone wishing to use our material for academic and/or commercial purposes would request permission to do this from the curators. For our own records, we like to know how the website is benefiting others. Whilst we are delighted for people to use the photographs displayed on the web site, we are unable to provide the pictures in any other format. If anyone wishes to use material that is specifically attributed to any other organisation, please would they request permission directly from that organisation.